Here's a unique salad that blends presentation with flavor. 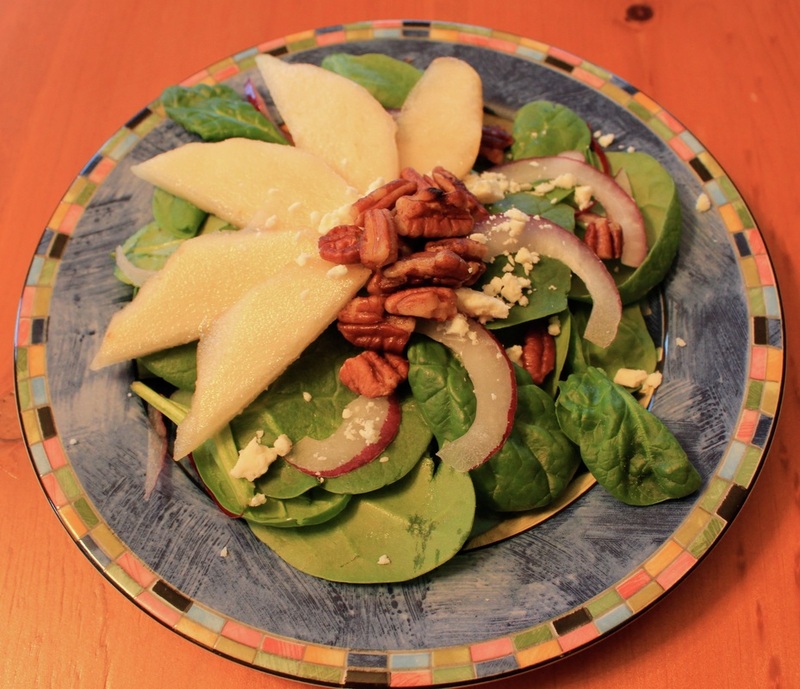 The combination of the soft sweet pears, the crisp fresh spinach, the crunchiness of the walnuts, and tangy Gorgonzola make a sumptuous salad. Try it with my Cranberry Champagne Vinaigrette or Poppy Seed Salad Dressing. Click here for a complete list of my salad dressing recipes. Heat a small skillet, melt the butter and toast the pecans. Make sure you keep an eye on them, you don't want them to burn. Equally divide the spinach leaves onto 4 salad plates. Decoratively place the red onion, pear slices, the Gorgonzola, and the toasted pecans on each plate.